If you are rewiring at home or in the office then consider including sockets with built-in USB connectors. Of course, when you need to or are considring rewiring you will need to talk to a qualified electrician. 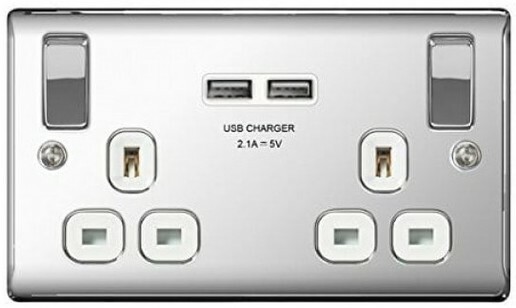 They are suitable for safely charging most portable electronic devices connected via a USB 2.0 or 3.0 type A plug. Most will fit easily into a standard back box. Some of the smart ones can communicate with your devices to make sure they deliver maximum charge so that you are quickly at full power again. Never again will you have to worry about losing your charger plug and cable. These are a neat and convenient way to keep all of your portable devices chanrged and ready to use.